What Are You Doing Different This Year Than You Did Last Year? Also: How To Stop Making The Same Mistakes And Much More! Editor’s Note... I love being creative. I didn’t realize it until I was given the chance to express myself. It started with cooking then I moved on to poetry, 3D Animation, Public Speaking and now writing. Expressing my creative side has always given my life. Just like getting juice from an orange, I have kept squeezing out my expression in one way or another. Next Generation Speakers Magazine is yet another expression of that creative side. I invite you to find helpful information as well as inspiration in these pages. 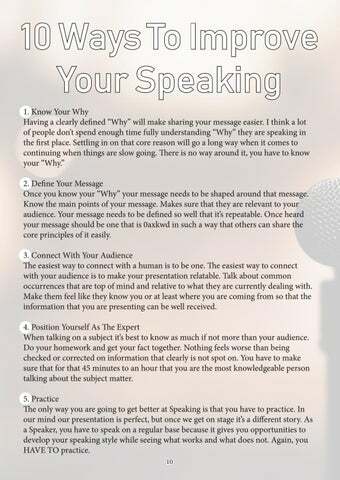 If you are looking for tools and tips on how to be a better speaker or even looking for your next keynote speaker this is the magazine for you. 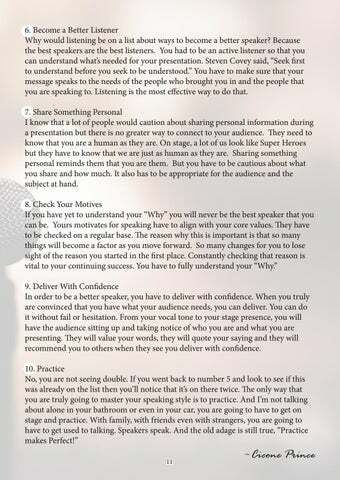 I look forward to your feedback and your ongoing interest at either becoming a better speaker or finding your next speaker. His oldest son was the main reason that he pursued his Bachelor’s Degree in Electronic Engineering. He already had an Associate Degree in Electronics but he didn’t want to spend his life fixing other people’s problems, he wanted to create his own. So the Bachelor’s Degree would allow him to become the Mad Scientist that he longed to be. Because family was one of his core values, being a husband and a father was in line with the future that he wanted. His oldest son was the main reason that he pursued his Bachelor’s Degree in Electronic Engineering. He already had an Associate Degree in Electronics but he didn’t want to spend his life fixing other people’s problems, he wanted to create his own. So the Bachelor’s Degree would allow him to become the Mad Scientist that he longed to be. Because the family was one of his core values, being a husband and a father was in line with the future that he wanted. One of the best lessons that he learns came from the Saturday morning cartoon Spiderman, “With great power, comes great responsibility.” The quote is just a paraphrase of Luke 12:48b For unto whomsoever much is given, of him shall much be required; and to whom men have committed much, of him they will ask the more. 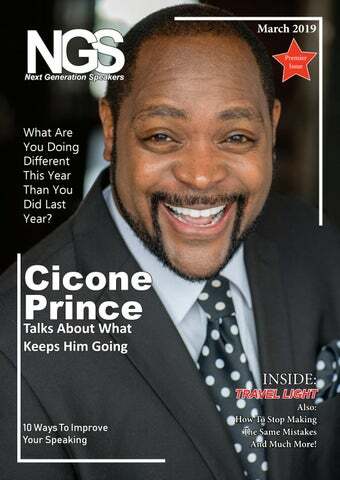 So Cicone recognizes that he has been given much, and that much comes with a responsibility that goes far beyond any hurtle or roadblock that might be in his way. Whether internal or external. Janee’ V Towns at the time of her death was a mother, sister, daughter, student, parent advocate, & social justice liaison. Janee was also a Parent Leader that believed in family, community, and perseverance . She was one who had a vision to always have an open door for those rejected, violated and thrown away without hope. The JVT Foundation was established to honor the memory of Janee “ Peaches” and the board of directors is comprised of stakeholders who are dedicated to preserving the dreams, goals and vision of Janee who was a catalyst and lived her life sharing hope, compassion, & strength . Janee’ was a catalyst who lived her life sharing hope, compassion, & strength to all who was in need. Do You Need A CORPORATE DJ For Your Next Event? one mission. We promote and support artists of all types. We get you noticed. So, because you’re not really thinking about your actions as you pass through your routine day, this allows your mind to drift from the current moment into the realm of worry, concern, future plans that might hold failure and fear. Travel takes you outside of this because you have to find the gate to the flight that you’re not having to find on a daily basis. So you have to think about this moment now. It’s funny how the peace we always seem to be seeking is simply just in the current moment we’re living in and IGNORING. Travel is a nice way to pull your attention into the moment. The very nature of travel pulls your mind into a less cluttered state. But it’s good to remind yourself that being open and excited about this coming adventure is ok. It’s ok to not worry about every single solitary aspect of your existence and let yourself drift into a daydream that you’ll meet Oprah and she’ll put your books and blogs on the map. So, travel light. Mentally light. And finally, traveling brings a wonderful lightness to your soul. Travel light. 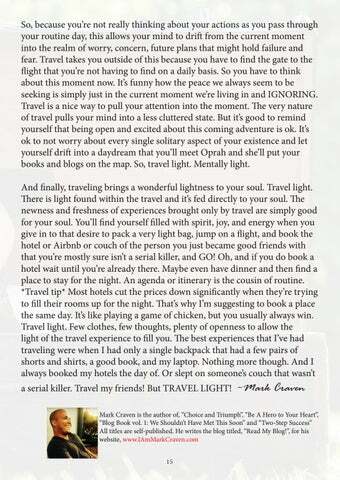 There is light found within the travel and it’s fed directly to your soul. The newness and freshness of experiences brought only by travel are simply good for your soul. You’ll find yourself filled with spirit, joy, and energy when you give in to that desire to pack a very light bag, jump on a flight, and book the hotel or Airbnb or couch of the person you just became good friends with that you’re mostly sure isn’t a serial killer, and GO! Oh, and if you do book a hotel wait until you’re already there. Maybe even have dinner and then find a place to stay for the night. An agenda or itinerary is the cousin of routine. *Travel tip* Most hotels cut the prices down significantly when they’re trying to fill their rooms up for the night. That’s why I’m suggesting to book a place the same day. It’s like playing a game of chicken, but you usually always win. Travel light. 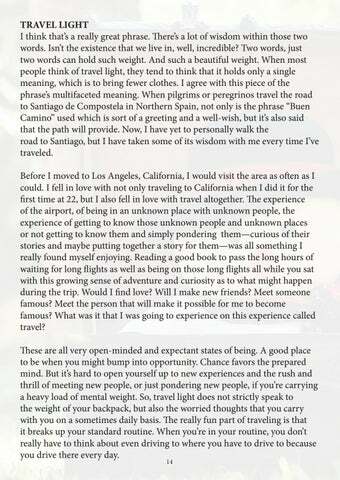 Few clothes, few thoughts, plenty of openness to allow the light of the travel experience to fill you. The best experiences that I’ve had traveling were when I had only a single backpack that had a few pairs of shorts and shirts, a good book, and my laptop. Nothing more though. And I always booked my hotels the day of. Or slept on someone’s couch that wasn’t a serial killer. Travel my friends! But TRAVEL LIGHT! WORKING WITH TIFFANY "Remote Secretary Support" If Only I had Some Help - Now You Do! Obstacle #2: Dealing with the Truth The truth of the matter is I was not satisfied with my “Good Government Job.” I had all the trappings of what people considered “success”, but I just was not happy. Can anyone of you relate to that feeling? While I enjoyed all of the benefits of the job, deep down inside I was yearning for more. The passion for the job was gone and a burning desire for something more had taken its place. I dreamed of a lifestyle that gave me time and flexibility to make my own hours. I wanted to be available for my family. I wanted to travel at a moment’s notice without asking permission. There was a popular lyric back in the day by the O’Jays that said, “Your body’s here with me, but your mind is on the other side of town.” That is exactly how I felt. The truth of the matter is that I was doing just enough to “hold on” to this job while I figured out my next move. I had become bored with 10 years of doing the same job and I was no longer challenged. According to a 2013 article posted on www.glassdoor.com/blog, boredom is one of the “Top 10 reasons to breakup with your job”. I had a desire to move, but fear made me stay. 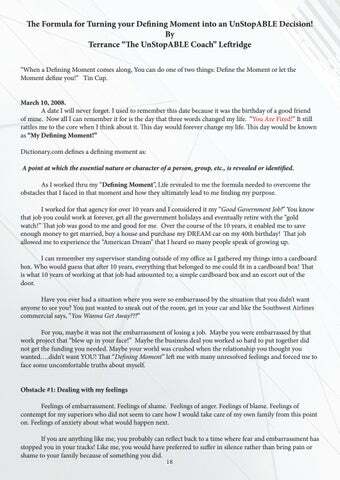 My “Defining Moment” forced me to face the truth!” Each one of you will have a “defining moment” in your life. How you act and react to that moment will determine how that moment defines you. Your “Defining Moment” can lead to an “UnStopABLE Decision” if you follow some of the tips in this article. Being fired encouraged me to pursue my dreams. Once I made my decision to make something out of my defining moment, I was set on a path towards being Unstoppable! There were four principles I learned throughout this journey that I will share with you in hopes you can be Unstoppable too! Here is the first decision you have to make and it is rather simple. TIP #1: Start You can never hope to achieve anything unless you start something. For me, I had to begin making big changes. I had to decide to start a new career. So for the next 6 months after my termination, I invested my time and money in pursuing my dream of really helping people in a more personal, intimate way than what I did now. I started a life coach-certification program and became certified within 8 weeks. Starting something rejuvenated my spirit and took away my feelings of depression and despair. I felt like I was worthy again and saw a future filled with helping others achieve their dreams as well. Your Defining moment has the POWER to force you to START living the rest of your life! The key is to TAKE ACTION and don’t be afraid to fail. TIP #2: Fail: Don’t be afraid to FAIL Nothing beats a failure like a try, but if you never try, you have already failed by default. “Failure is part of the process”. If you never fail, you will never learn to succeed. Once upon a time, a company wanted to create a new product to help cut grease on stoves and countertops. They came up with a formula and they tested it. The 1st one failed to work. They modified and tested the formula again. They tested it 5 times, 10 times, 50 times with no success! They tweaked the formula and refused to give up on the idea. They tested the formula 100 times, 200 times, 300 times and 400 times. It still failed. The company surely would not have been blamed for stopping the tests at this point, but they did not stop. Test numbers 401 thru 408 also failed. One more tweak and one more test took place. Finally, a formula was found that worked for the company! What is that product? FORMULA 409: the most popular degreaser on the market used by millions of customers around the world. Imagine if that company has given up. Imagine if they had allowed fear of failure to get the best of them. If you are honest with yourself, can you say you have tried over 409 times to build your business, improve your personal development or create that next Unstoppable idea? Probably not. I couldn’t let the possibility of “failure” stop me from following thru on my Unstoppable decision. The same will hold true for you and your decisions. Keep trying. Keep following the process and see what you can learn from each failed attempt. The Formula for Turning your Defining Moment into an UnStopABLE Decision! 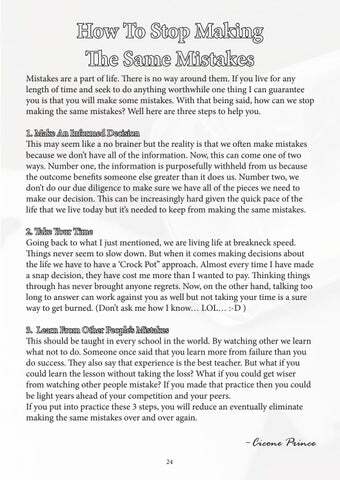 (continued from page 19) TIP #3: LEARN I’ve started a lot of things in my life and I have failed at a lot of things in life. In the process of failing at those things, I’ve learned some things that have led to my ultimate success. With each lesson, I’m continuing to write my success story. Once you recognize that learning is part of the process, you will be on your way to having your Unstoppable decision become an ultimate success. So what are the lessons that you need to learn from your past failures? What is it that you can do differently now that would lead to your ultimate success down the line? For me, I had to learn to step out on faith and pursue the career I wanted for myself. It has not been an easy decision, but it has been worth it. I also learned that I didn’t have to do it alone. I learned that there were people I could ask for help, for guidance and for coaching. Because I was willing to ask for that help, I was able to move faster and farther than I’ve ever been on my own. I am not where I want to be as of yet, but I am learning to be who I was created to be each day. Moreover, because of that, I feel like more of a success each day. TIP #4: SUCCEED Many famous celebrities and have followed the process of Start, Fail, Learn, Succeed to reach the pinnacles of their status. Walt Disney in 1919 was fired from the Kansas City Star newspaper stating he lacked imagination and no good ideas. He failed at that, but didn’t stop. Disney owned a company called “Laugh-O-Gram” and drove it into bankruptcy. He failed again, but didn’t give up. He learned from his failures, tweaked his ideas and later created a dynasty based around a mouse, Mickey Mouse. Now the Disney Company celebrates 50 years of success in entertainment, theme parks and cinema. Oprah Winfrey was fired from one of her early jobs in the news industry. Now she owns a media conglomerate called the OWN Network. These are just a few examples of people who have started and failed, but learned to succeed. They are and were ordinary people like you and me. Success is possible for anyone. If they can do it, you can too! “I am not where I want to be, but thank GOD I am not where I used to be!” I say these words to myself frequently when I face a failure in my life. I use this phrase as a way to reflect on the journey of my life after I made my Unstoppable Decision. My goal is to be the best life accountability coach, speaker, emcee and media host I can be. And while my coaching clients have increased, my emcee business had blossomed and my media shows have gained traction, I still have room to grow. I have had success in my new career and I use that as the fuel needed to pursue future success. I believe the same is in store for you if you just follow the process. That’s my message for you right now. Whatever you are going thru now and whatever you have failed at recently, recognize that Failure is not Fatal. It is not the end of the book; it is just the beginning of your new chapter. Once you recognize that you must START, FAIL and LEARN in order to SUCCEED, nothing will be able to STOP you. You have the ABILITY to Define Your Moment with an Unstoppable Decision. You have the ABILITY to make a difference in your life and the lives of your family, friends and community. You will not only have the ABILITY to live the life you were created to live, you will NOT BE ABLE to be STOPPED by the obstacles of Life. You will be UnStopABLE!!! Why would you ever settle for less when you can Be UnStopABLE? If you need some additional help and coaching to help you Define Your Moment instead of having it Define You, then consider contacting me for a complimentary conversation with Unstoppable Coaching Services. We aim to help you Create your Vision, Implement your Vision and hold you Accountable to living the life you were created to live! Sign up on the contact page at www.unstoppablecoaching.com. While you’re there, you can check out my upcoming events, listen to past episodes of my “UnStopABLE Stories” podcast and purchase your own “I Am Unstopable” apparel. Wherever you are in the World today, don’t just make it a great day. Make it an UnStopABLE” Day! What Are You Doing Different This Year Than You Did Last Year? We just celebrated New Years. It’s a New Year with New Mountains and New Possibilities! If this year is really going to be different from last year, what are you going to do this year to make it better? What steps are you going to take get closer to your goals and your dreams? Or are you going to sit and make the same old excuses? The thing about excuses is that you can’t deposit them! If you could I know a lot of people that would be filthy rich because all they have is excuses! But in order to make this year different from last year, there are some things you are going to have to do. 1. Make a Commitment A commitment to yourself. A commitment that goes beyond the feeling of the moment. You are going to have to make a commitment to your dreams to your goals for your future and making your life better. 2. Invest in Yourself Put your money where your mouth is. You said that you were committed, you said you wanted to do something, you said you wanted to get something accomplished. But what are you doing? What programs are you attending? What classes are you taking? What books are you reading? That’s going to get you closer to your dreams. What research are you doing to get better at what you said you want to do? 3. You need to get a Coach I know that you have heard that time and time again but it’s true. Anyone who has done anything worthwhile has had someone to mentor them. Somebody to help them see things they could not see. Someone to hold them accountable. And getting a Coach is one of the quickest ways for you to get closer to your goals because they see stuff you don’t see. They hold you accountable and they give you that extra added push that you need in order to accomplish your goals. 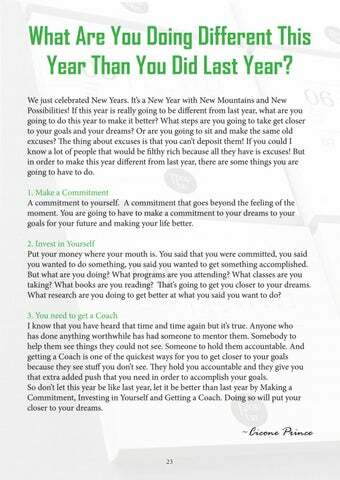 So don’t let this year be like last year, let it be better than last year by Making a Commitment, Investing in Yourself and Getting a Coach. Doing so will put your closer to your dreams. Mistakes are a part of life. There is no way around them. If you live for any length of time and seek to do anything worthwhile one thing I can guarantee you is that you will make some mistakes. With that being said, how can we stop making the same mistakes? Well here are three steps to help you. 1. Make An Informed Decision This may seem like a no brainer but the reality is that we often make mistakes because we don’t have all of the information. Now, this can come one of two ways. Number one, the information is purposefully withheld from us because the outcome benefits someone else greater than it does us. Number two, we don’t do our due diligence to make sure we have all of the pieces we need to make our decision. This can be increasingly hard given the quick pace of the life that we live today but it’s needed to keep from making the same mistakes. 2. Take Your Time Going back to what I just mentioned, we are living life at breakneck speed. Things never seem to slow down. But when it comes making decisions about the life we have to have a ‘Crock Pot” approach. Almost every time I have made a snap decision, they have cost me more than I wanted to pay. Thinking things through has never brought anyone regrets. Now, on the other hand, talking too long to answer can work against you as well but not taking your time is a sure way to get burned. (Don’t ask me how I know… LOL… :-D ) 3. Learn From Other People’s Mistakes This should be taught in every school in the world. By watching other we learn what not to do. Someone once said that you learn more from failure than you do success. They also say that experience is the best teacher. But what if you could learn the lesson without taking the loss? What if you could get wiser from watching other people mistake? If you made that practice then you could be light years ahead of your competition and your peers. If you put into practice these 3 steps, you will reduce an eventually eliminate making the same mistakes over and over again. Mistakes are a part of life. There is no way around them. If you live for any length of time and seek to do anything worthwhile one thing I can guarantee you is that you will make some mistakes. With that being said, how can we stop making the same mistakes? Well here are three steps to help you. We just celebrated New Years. It’s a New Year with New Mountains and New Possibilities! If this year is really going to be different from last year, what are you going to do this year to make it better? What steps are you going to take get closer to your goals and your dreams? Or are you going to sit and make the same old excuses? I think that’s a really great phrase. There’s a lot of wisdom within those two words. Isn’t the existence that we live in, well, incredible? Two words, just two words can hold such weight. And such a beautiful weight. When most people think of travel light, they tend to think that it holds only a single meaning, which is to bring fewer clothes. I agree with this piece of the phrase’s multifaceted meaning. From the way you dress to the way that you talk, people think they know you. They think they know what makes you tick. They think they know what motivates you. Most of the time they are wrong. Most of the time they have no clue.